All transactions are safe and secure with a reliable history in online purchasing behind each of our associates. Buy the Jailhouse Rock t-shirt to own Elvis clothing and merchandise. "The warden threw a party in the county jail. The prison band was there and they began to wail. The band was jumpin' and the joint began to swing. You should've heard those knocked out jailbirds sing. Lets rock. Everybody, lets rock." This Elvis Jailhouse Rock shirt will have you singing like the jailbirds in no time. If you'd rather be singing about the bright lights of Sin City instead, then check out the Viva Las Vegas t-shirt and the logo TCB t-shirt. All of our Elvis tees are sure to please. 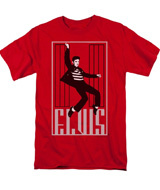 In addition to the Jailhouse Rock tee above, browse the Elvis Clothing Gallery for more apparel like men's and women's clothes, kids shirts or hoodies.